Understand the eligibility requirements and benefits of a 403(b) plan compared to traditional employer-sponsored plans to benefit from this special type of savings vehicle. The catalog of numbers, IRS designations and names for retirement investment plans can border on befuddling. Unless you enjoy reading through mountains of pages from the Internal Revenue Code, you could miss out on putting together the perfect combination of plans that can best get you to your retirement goals. Fortunately, 401kRollover has published a series of guides on the different plans and in language that is easy to understand. 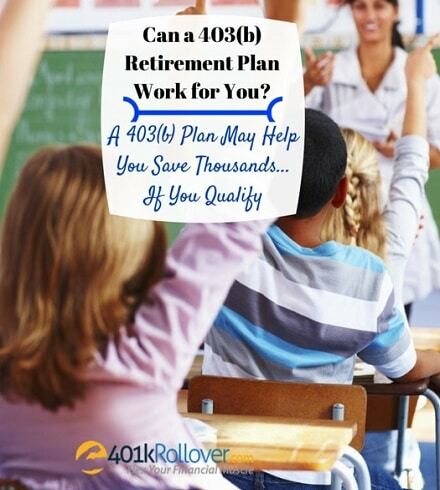 Most likely, you have never heard of a 403(b) plan because you may not be eligible. If you are eligible, the plan offers an excellent alternative to traditional 401(k) plans to save money for retirement and lower your current tax bill. The fact that 403(b) plans are referred to under several different names doesn’t make understanding them any easier. The plans are often referred to as tax-deferred annuity plans, a voluntary savings plan, a supplement plan or a tax-sheltered annuity (TSA). Beyond the complexity of what to call the savings vehicle, 403(b) plans are actually pretty simple and are one of the best retirement savings options for employees. The plan is set up by your employer and receives contributions from both the employer and the employee. Eligibility for the plans is restricted to certain non-profit and public employees. Contribution limits for the plan fall under two IRS codes, 402(g) and 415 of the internal revenue code. Section 402(g) applies to the contributions you make into the plan on a pre-tax or after-tax basis. It’s more common to make pre-tax contributions since it reduces current taxable income and lowers the taxes you owe in the contribution year. As with other retirement savings vehicles, returns in the plan grow tax-deferred until you withdraw them. Some employers permit after-tax contributions into a 403(b) plan, also known as Roth contributions. You pay taxes on the income during the contribution year, but withdrawals are tax-free when you retire. The option can be a great choice if you expect your tax rate to be higher in retirement or to balance out your retirement tax liability with tax-deferred plans. Section 415 applies to contributions from your employer into the plan. These can also be on a pre-tax or after-tax basis. Am I eligible to contribute to a 403(b) Plan? Eligibility for a 403(b) plan is what sets it apart from the 401(k) plans used by most employers. TSAs are only open to employees of a tax-exempt organization established under 501(c)3 status, such as schools, hospitals and churches. These include employees of public schools, cooperative hospital service organizations, employees of public schools organized by Native American tribal governments, and certain ministers. If you are eligible for a 403(b) account, you are not able to set up an account yourself. Only an employer with eligible employees is allowed to set up a plan. Employer contributions in 2015 are limited to $53,000 or a 100% match of employee compensation. This can be an attractive benefit for employees of non-profit organizations. For your own contributions, the 2015 limit is $18,000 for people under 50 years of age. If you have been working for an eligible employer for more than 15 years and have contributed less than $5,000 a year (on average), you may be allowed to contribute an additional $3,000 above the $18,000 contribution limit. These catch-up contributions are limited to $15,000 over your lifetime. Additional catch-up contributions may be available if you are over the age of 50 years. Under these circumstances, you can contribute up to $24,000, or up to $27,000 if you elect to make the additional $3,000 annual catch-up contribution. Contributions can be made as elective deferrals, non-elective deferrals and as after-tax contributions. Elective deferrals are made under a salary-reduction agreement and allow your employer to withhold money from your paycheck to be automatically contributed. Non-elective deferrals are paid by your employer and generally include matching and discretionary contributions. The rules for withdrawals from your 403(b) plan are generally similar to other types of retirement savings vehicles. You may begin withdrawing assets without penalty when you reach 59 ½ years and are required to start taking distributions when you reach 70 ½ years. If contributions were made on a pre-tax basis, any distributions will be counted as income and you will be responsible for federal and state income taxes on the amount. You are laid off from employer and are at least 55 years of age. You are laid off from employer before 55 years of age but take substantially equal payments for a minimum of five years or until age 59 ½ , whichever is later. You are allowed to withdraw money from your 403(b) plan under certain hardship conditions described below, but will still be responsible for the 10% penalty and any income taxes. Tuition and related educational fees for immediate family members over the next year. Payments necessary to prevent eviction or foreclosure from principal residence. Funeral expenses of immediate family members. Medical care expenses of immediate family members. Need more help understanding the 403(b) plan and how you can use it to meet your retirement savings goals? Visit 401kRollover for information and personal assistance. How is a 403(b) different from a 401(k) plan? 403(b) plans are similar to the more popular 401(k) plans but are specific for employees of certain organizations. The two types of plans are usually identical and only differ by eligibility. One benefit of 403(b) plans is that vesting is often immediate in the plans, while those in a 401(k) plan may have to wait years to be fully vested in their employer’s contributions. Can my employer exclude an employee from participating in a 403(b) plan? Are contribution limits to a 403(b) plan affected by the contributions I make to other retirement savings plans? Yes, your contribution limit is reduced by contributions you make to other plans including: 401(k), SIMPLE IRA plans, other 403(b) plans and SARSEP plans. Are employers required to make contributions to plans for eligible employees? No, employers are not required to make contributions. Can I transfer my 403(b) plan to another account or employer? Yes, plan transfers are allowed if they meet certain circumstances. Are loans available on my 403(b) plan? Yes, plans may offer, but are not required to provide, loans on plan assets.